You can arguably say that Suigintou is the best Saimoé contestant to never place a top 8 finish. Not that her sisters had anything to do with it, right? What's interesting to note is that everytime Suigintou doesn't finish in the top 16 in Saimoé Japan or Korea, it's because one of her sisters knock her out before then. In 2005 Japan, Suigintou was knocked out early in the second round by Shinku, a margin of only 53 votes. Only a year after, Suigintou fared much better, dominating her first round and edging Saber (Fate/Stay Night) in the second round, but lost to her other sister Suiseiseki in the round of 32, finishing in a final position of 22nd place. So Suigintou isn't destined to become Alice after all? Not quite. Suigintou has placed consistently in the top 16 ever since - first by finishing a decent finish in 2006 Korea in 13th place. Upon her return in 2007, Suigintou was forced to go against Fate Testarossa (Nanoha) after dominating in the first round of Saimoe Japan. Setting a record for the most votes combined (over 3600) in the history of the second round, Suigintou managed to edge Fate by only 166 votes. After taking care of business in the round of 32, Suigintou made the top 16 before losing to Louise Francoise (Zero no Tsukaima) by only 25 votes. Suigintou placed 9th. In Korea, Suigintou was immediately placed in a preliminary first round matchup against Konata Izumi (LS). 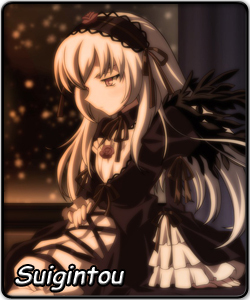 Suigintou edged her by only 8 votes, but both had the opportunity to go on. After an easy second round where she dominated with 64% of the vote, Suigintou headed to the final preliminary round with the infamous matchup with both Setsuna Sakurazaki (Negima?!) and Shana (Shakugan no Shana). Although Suigintou won this match by 66 votes, her victory was placed as a mere afterthought, as both Setsuna and Shana tied for their final transfer spot to the top 64, giving leeway to all three contestants. Suigintou continued to take down opponents in the knockout rounds, including a dominating round of 64 by 787 votes and a 74 point victory over Vita (Nanoha). However, in the Round of 16, she met Fate once again, and this time, Fate came out for revenge. Suigintou ended up losing by over 400 and would place 10th. Suigintou returned in November to take part in the Korea Super Best Moe Tournament of 2006-2007, being one of the six contestants to place in the top 16 in both Korea competitions. However, her preliminary round was mere déja vu, as her victory over very strong opponents, including Setsuna again, was overshadowed by both Mai Kawasumi (Kanon) and Eri Sawachika (School Rumble), who were involved in a dispute in which the votes were miscounted. Her move to the round of 16 after the disput was a short one, as Suigintou was completely dominated by a rematch with her other preliminary friend Shana by over 600 votes. As one of the more consistent contestants, Suigintou aims to finish even better than a top 16. A top 8 finish should bode well for the Rozen Maiden doll with an incomplete body. Although her desire to become "Alice" comes first and foremost, Suigintou loves her father, and she aims to complete this secondary goal of winning the International Saimoé crown.